The outlook for electricians is bright, with a steady rate of job growth projected as the demand for alternative energy sources increases. Learn how to spark a hiring manager’s interest with our electrician resume sample and writing tips. 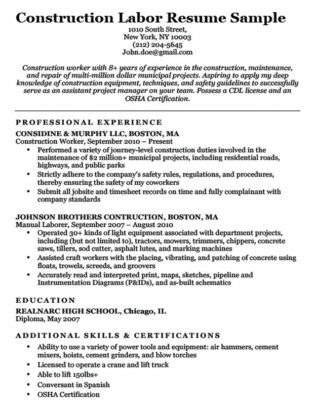 For more help, try our easy-to-use resume builder. Our software’s professionally formatted resumes and industry-specific bullet points will help save you time. Curious about resumes for other industries? Take a look at others in our free resume library. Need help getting your resume to stand out from the rest? Check out our stylish resume templates for designs that are sure to impress. For tips on how to draft the perfect cover letter, look through our complete list of cover letter examples for some inspiration. 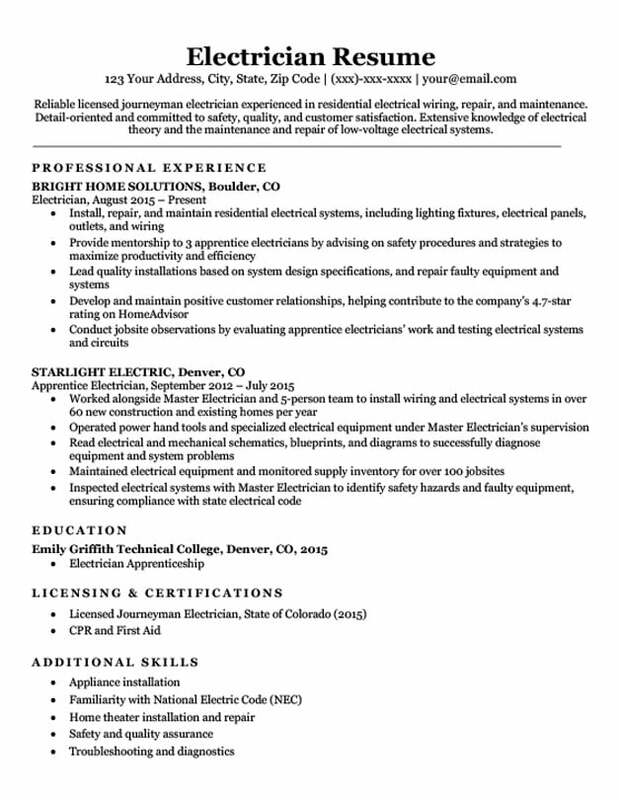 Reliable licensed journeyman electrician experienced in residential electrical wiring, repair, and maintenance. Detail-oriented and committed to safety, quality, and customer satisfaction. Extensive knowledge of electrical theory and the maintenance and repair of low-voltage electrical systems. 1. Specify your licensing and certifications. The road to becoming an electrician is a long one with three different levels of certification: apprentice, journeyman, and master electrician. Given the different classes of electricians, it’s crucial to include your formal training; this will tell employers the scope of work you’re qualified for. Given the different classes of electricians, it’s crucial to include your formal training; this will tell employers the scope of work you’re qualified for. People interested in electrical work start off as apprentice electricians, typically working as helpers and assistants for master electricians before they can attain journeyman status. Journeyman electricians have more formal training and experience, and can perform unsupervised work. Master electricians are at the head of the pack — they tackle more complex electrical work and supervise journeyman and apprentice electricians. As with other technical professions, state electrical boards have different licensing and certification requirements for each level as well as unique reciprocity agreements across the U.S. Consequently, whether you’re looking at job openings within your home state or outside of it, it’s always a good idea to identify where you are legally certified. Understanding the distinction between these specializations and specifying your familiarity with one will give employers a better sense of your skills and capabilities. Check out how our sample candidate makes their experience in residential electricity clear. Besides noting their experience with residential wiring in their resume profile, our candidate also details the number of homes they’ve helped wire in their professional experience. 3. Tailor your skills section. A strong skills section adds details that didn’t make it into your work history. However, writing this section can often become a slippery slope, as some candidates have a tendency to list broad or irrelevant skills. You can avoid this by using terminology that describes industry-specific performance rather than overused phrases anyone might use. Need a refresher on putting together a skills section? We’ve got your back — read more about how to write an effective skills section. Follow these tips to give your electrician resume some extra voltage and score an interview!